Welcome! Hope you like what you see! The photo you see is an actual picture of our farm truck 'Ol Blue' and our Savannas. The adventure all started back in 2004 when we decided to get some lawn mowers (goats that is). 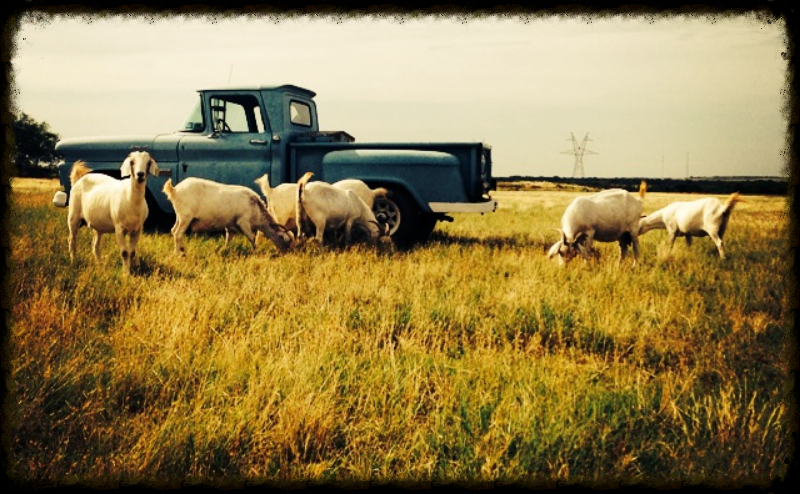 A friend of ours had Boer goats which seemed like a good choice for our situation, so we started our herd. ​​In 2008, we had heard of the Savanna Breed. After further research about the breed we decided that if we were going to go through the effort of feeding and doctoring out herd, we might as well have the best breed! We soon bought our first full blooded Savanna buck and two Savanna Does to begin our full blood line of Savanna's. Next, we got rid of our Boer buck and bred our Savanna buck to our Boer nannies and the full blooded Savannas. Within the first season we immediately saw a difference in our new becoming herd. The improved mothering abilities were quickly noticed. The young were already stronger, including the half blooded Savannas and these mothers were able to produce sufficient milk to raise their own young. Our babies have become very tolerant to hot and cold temperatures and initial hurdles such as worms became shockingly a minimized issue. We've always said raising Savannas shows many similarities to raising cattle. Savanna goats are strong, good grazers, and are very independent. Our Savannas graze coastal Bermuda pastures and coastal hay when Bermuda isn't available. Stallcup Savannas are supplemented with very little feed and or grain which we believe increases the quality of our herd. All of our goats are registered with Pedigree International and are micro chipped when sold for further breed reference. ​As any business, it is a learning experience every day. We love having the pleasure and convenience of going out the backdoor or looking out the window to see how everyone is doing. We are a small town operation but we are honest, hardworking, and take pride in what we raise and sell. We won't sell breeding stock that we wouldn't want to keep for ourselves, which we accomplish by culling.